Nova Scotia Fisherman ocean lotion is a premium all natural product that is a real treat for your whole body. You will fall in love with its creamy smooth texture. It is made from plant and tree derived oils and skin friendly botanical extracts. 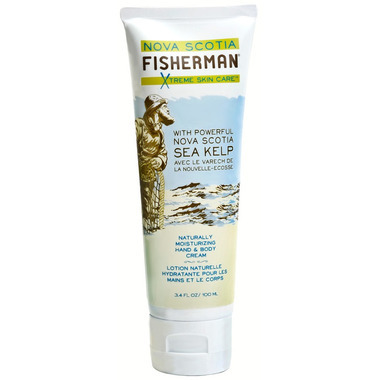 Nova Scotia Fisherman lotion improves skin’s texture, leaving it looking and feeling rejuvenated. Naturally nourishing, non greasy lotion that is perfect for the whole body. Vegan too! Wonderful product - works really well to combat winter weather dry hands. Very lightly scented. Great non greasy feel, lovely mild scent. Will order again! Bought for my dry skin in winter and had great results. A bit of an unusual scent to it, but quickly got used to it. bought this for dry winter skin and it is so good. I was ordering these products directly from the website but so glad well.ca carries this line.